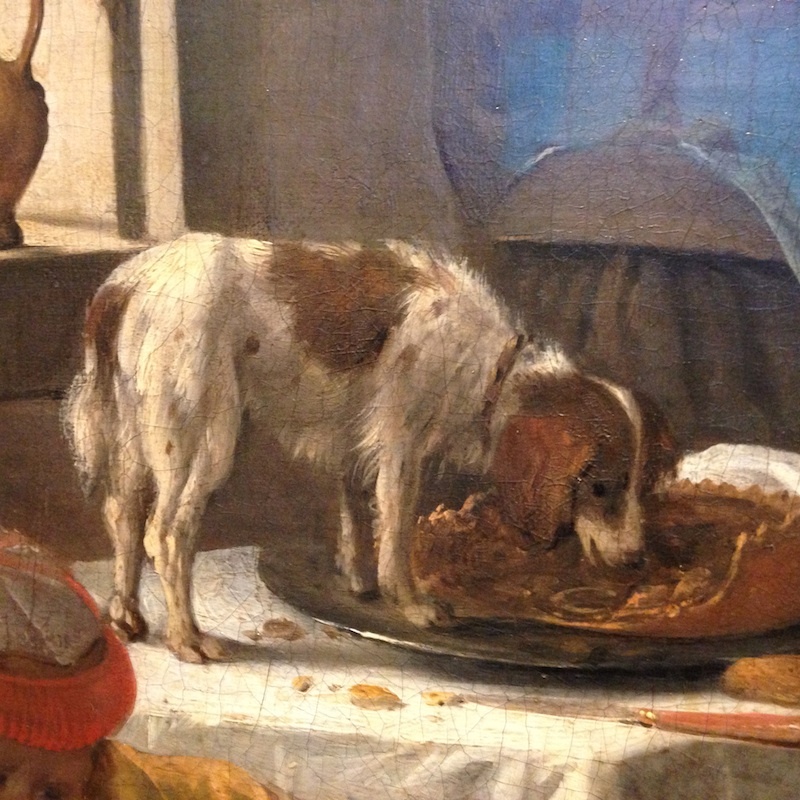 I’ve been on the road in Europe, enjoying many things, including visiting museums and noting lots of dogs in art, like the one above doing what dogs have always done when no one is looking! I think it’s fun to see canine friends immortalized in paint and wonder about their lives so long ago. I always find when I’m in Europe my American timeline gets seriously disturbed–at home, a building that’s a hundred years old is ‘wow.’ In Europe, a tour guide will call it ‘quite new.’ The same goes for art. It’s interesting that the different types of dogs have existed for hundreds of years. 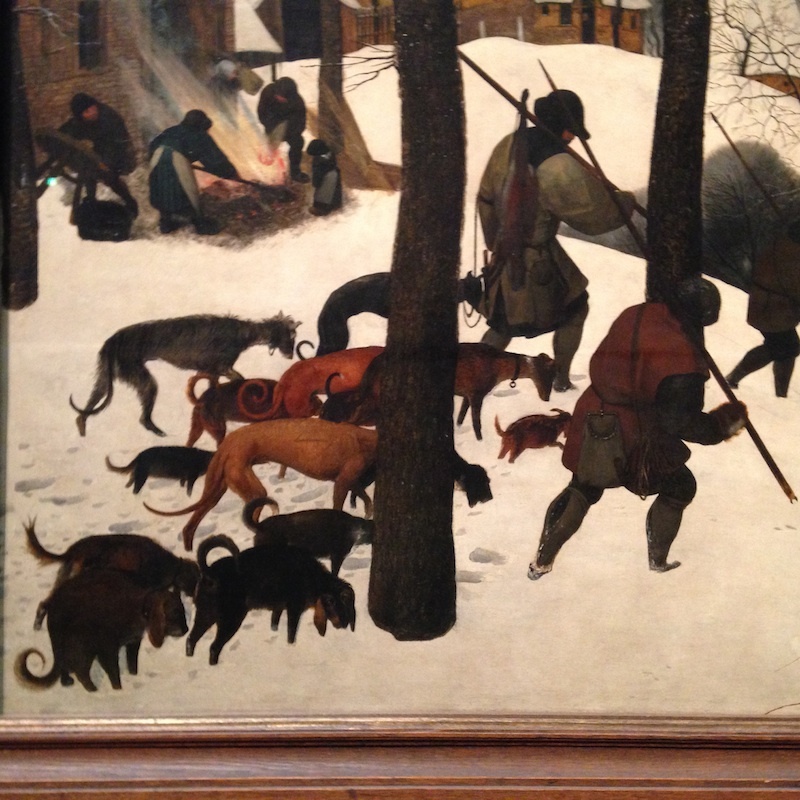 Take this image from Bruegel’s 1565 painting “Hunters in the Snow,” depicting the return from a fox hunt. It’s easy to identify various breeds with different jobs. There are long-eared dogs in the foreground for finding the fox’s scent, greyhoundlike dogs for chase, and small terriers to dig out the fox from its den. The exhausted hunters slog home with their only trophy, a single fox. This dog–I think it’s also from Bruegel, but I forgot to label it–looks like a pointer. The expression on its face as it looks up to its person is universally recognizable! Sometimes the dogs don’t resemble something familiar, at least to me. 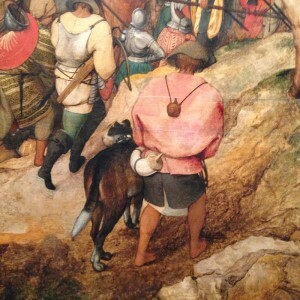 This one is from another Bruegel painting, and I wonder if its ears have been trimmed and if so, did they put on dog fights way back then? This hefty fellow could be a guard dog and/or a fighter, or…? 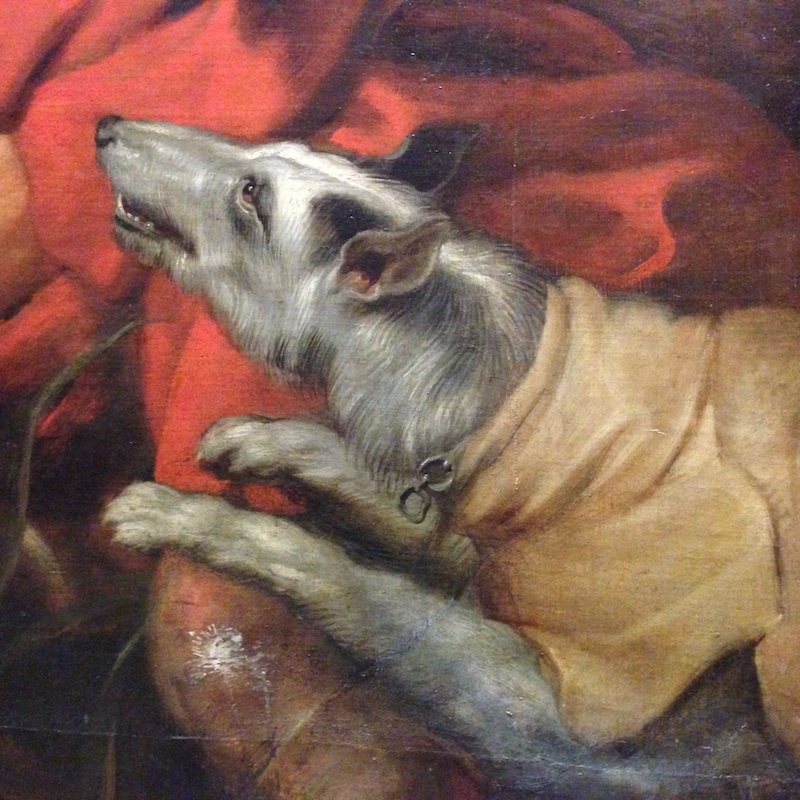 Lastly, here’s a gorgeous dog from a cooperatively created painting from Van Dyke’s studio around 1620. It’s called “The Calydonean Boar Hunt.” Frans Snyders painted the animals in the work, Jan Wildens did the landscape, and Van Dyke completed the whole painting. I can’t see this dog as similar to a breed I’m familiar with, but I wouldn’t mind having just like it in my home! This dog is willing and eager to help, even if it means risking its life. 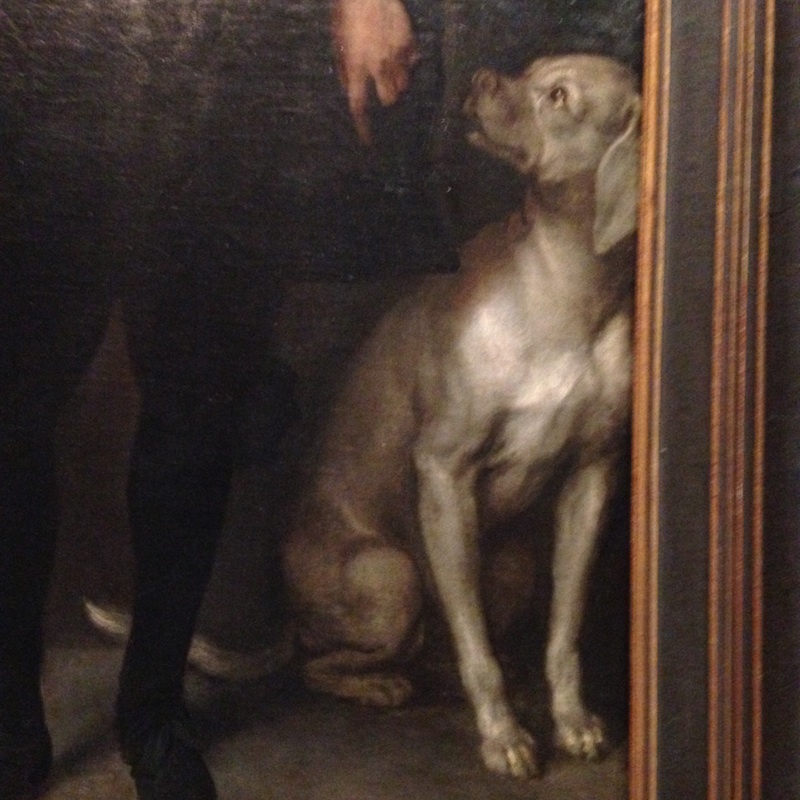 Amazing how many old painting featured dogs with humans. Shows how important our connections with dogs are. Interesting. I wonder if it is possible to trace the names of dogs in portraits of famous people? Probably lost in time. It would be fun to know, but for these works I would assume the dogs were nameless or name unknown to the artist. I’m going to do another post with children and dogs, when you’d think the dog’s name would be known, but it isn’t in the titles to any of the paintings. What a lovely post and such a neat way to approach an art museum. Thank you! Thanks, Kate–glad you enjoyed it. I’ll have more from Europe coming up as I have time, including a couple about the two dog behavior research labs I visited in Vienna and Budapest; both fascinating! What a great way to look at paintings! So many talented artists painting the animals they were familiar with. Thank you for the insights. Thanks for your comment, Leslie. Yesterday we saw lots of Impressionist paintings and nary a dog in sight! But I have some of dogs with children I’ll use in another post–stay tuned! I truly enjoyed your focus on dogs in art during your European visit. It would be fun for us to visit some American museums with the same focus. Great job Dorothy. Thanks for your comment, Linda. Yes, that would be fun. American artists, however, will only have been at work for about 200 years, so the dogs would be more recent. But of course american museums also have European art. I wouldn’t expect Asian art to have much in the way of dogs, but you never know until you look!